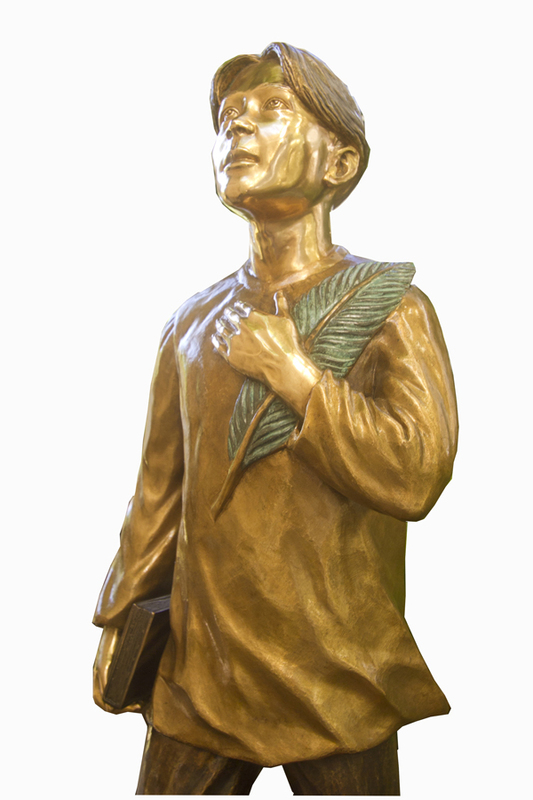 The first bronze sculpture of San Pedro Calungsod de Cebu is designed by Franz Herbich and casted by Herbich International Art foundry in Cebu to honor the saint. While the picture below shows the bronze statue in its whole size, the picture to the left shows a close up and a more detailed view at the fine details of the bronze sculpture of San Pedro Calungsod. 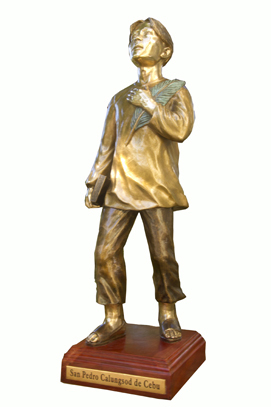 The first bronze statue is 78cm high and 24cm wide and weighs 20 kilos. The statue is available in different sizes and materials. The bronze statue has a mahagony pedestal with a brass plate. The resin sculpture of San Pedro Calungsod is handpainted and all resin. Saint Pedro Calungsod of Cebu was born in 1654. He -died April 2 1672, best known as San Pedro Calungsod de Cebu and Pedro Calonsor, is a Roman Catholic young Filipino saint and was a migrant, sacristan and missionary catechist, who suffered religious persecution and martyrdom in Guam for his missionary work in 1672. Whilst in Guam, Calungsod preached Christianity among the Chamorro people in the course of catechism, and also baptizing newborns, girls and boys and men and women at the risks and cost at this time being persecuted and also getting killed. Through his missionary efforts, many native Chamorros converted to Roman Catholicism. Calungsod was formally beatified on 5 March 2000 by Blessed Pope John Paul II. Calungsod was officially canonized by Pope Benedict XVI at Saint Peter's Basilica in Vatican City on 21 October 2012.